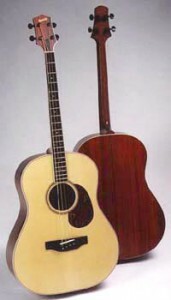 Possibly the first four-string cello guitar (tuned CGDA), BIG RED combines the best qualities of the flat-top guitar and the mandocello in one instrument. Originally based on a Bourgeois slope-shouldered dreadnought body, BIG RED is built with padauk back and sides, a spruce top, and a long 26.5″ scale (similar to a cello) that projects powerful bass response, great sustain, and clear separation of tones. BIG RED has none of the weak muddiness of most acoustic bass guitars, and none of the wimpiness of most mandocellos. Bass (even slap bass), rhythm, or melody are all possible on this unique hybrid instrument.